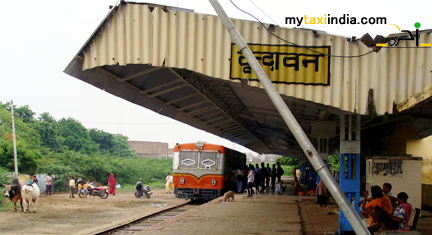 Vrindavan railway station is situated on Mathura-Vrindavan link in Mathura, Uttar Pradesh. Presently, it serves the city of Vrindavan. During the year 1889, Bombay, Baroda and Central India Railway started Mathura-Vrindaban branch line. It was 11 km long and 1,000 mm wide metre gauge. Mathura serves as the major railway junction of the city. Vrindavan is colourful town in the Mathura district, Uttar Pradesh, India. According to the some mentions in the epic Mahabharata, Vrindavan is precisely the site of an ancient forest where Lord Krishna spent his childhood days. The place offers a huge number of touring options for pilgrims and regular tourists. The major attraction here is the ISKCON Temple (Sri Krishna Balaram Temple) constructed by International Society for Krishna Consciousness (ISKCON) in 1966. Swami Prabhupada built this temple to spread the knowledge and teachings of holy book, Bhagawad Gita. The Yamuna River is considered to be a pious river of India. It originates from Yamunotri and reaches Delhi. Since the river originates from the transcendental city of Vrindavan and Mathura, it is considered holy by tourists and devotees who take bath in this river. Bankey Bihari Temple built in 1864 by Swami Haridas in the temple is dedicated by Lord Krishna. Kesi Ghat is situated on the bank of Yamuna River and works for a popular tourist attraction in Vrindavan. The legend has it that Lord Krishna took bath at this ghat after killing demon Kesi. Other important places of tourist attractions in Vrindavan include Madan Mohan Temple, Baake Bihari Mandir, Shahji Temple, Rangaji Temple, Jaipur Temple, Shree Radha Ras Bihari Ashta Sakhi Temple, Govind Deo, Seva Kunj and Nidhuban, Sri Vrinda Kund, and Prem Mandir. Hiring a taxi in Vrindavan will make your tour a convenient and pleasant affair. In case, you have been looking forward to visit the railway station of Vrindavan airport and take a trip to holy city of Vrindavan, reach us to help you make your trip memorable at all levels. At My taxi India we take special care of tour based requirements, expectations, and concerns of our esteemed patrons. Hiring our services will ensure you a pleasant, 100% safe, and no hassles trip to Vrindavan and nearby places. With us, it is as simple as booking a service online and relax. Our team will instantly send you a vehicle with experienced and well trained chauffeur. Book a taxi with MY Taxi India today and experience the difference.